Approximately a hundred years ago my grandfather Francis Nash (Frank) opened his decorating shop in Farringdon road Swindon. A shop containing all popular paint brands, brushes, all manner of decorating tools and Wallpapers. He was also a great painter and decorator, known for his remarkable work in graining (replicating different woods with paints and glazes). 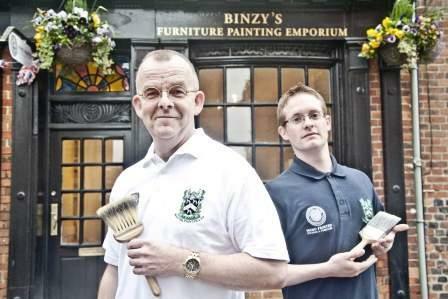 Now I am opening shortly, “Binzys furniture painting Emporium ” in Marlborough Wiltshire. Something I have been thinking about for some time, but it had to be the right shop, traditional looking and suitable . Lucky for me when I heard the Old Military bookshop in the parade Marlborough was becoming vacant, not one to hang about , three days later it was mine , a result & no mistake. The shop was part of the Lamb Inn , owned by Wadworths brewery, the Lamb has a tremendous reputation for its excellent real ales and Food, the shop is on the left hand side of the archway that many years ago would have been where the coach and horses would have gone through to gain access to the stables to the rear of the property, I believe the ” Shop” would have been where the coachman would have slept. Although it had been untouched for approximately 26 years plus, dark dingy and not at all welcoming, but I could see with work, this was perfect.Myself and my sons Matthew and Sam soon got to work stripping the place out , removing what can be only be described as horrible hardboard from all walls. This uncovered the original walls, picture rails & dado rails,old window vents , a beautiful crescent window and the original fireplace, my thoughts ” fantastic”. It was getting better by the day and revealing more and more traditional bits and pieces as time went by. It’s now two to three months in and almost ready. I get limited time to work on the shop as I am booked months in advance hand painting kitchens , mainly in London and Oxford. The main uses of it will be for the actual preparation and painting of furniture, also for preparing and painting kitchen doors, a place where potential clients can bring their furniture, drop it off and a few days later return to pick up their now transformed piece. Or we will go to their residence pick the furniture up return it to the shop and when completed deliver it back to their home. There may also be a possibilities of running courses for a small number of people to learn the various painting techniques such as: antiquing , marbling & graining etc. These type of courses seem few and far between, especially in Marlborough. Whilst I’m away painting in London etc my son Matt will hold fort and run the shop. As for selling materials, it will be limited to specialist brushes & furniture painting tools and most importantly our own range of paints, which after a large amount of research and time is looking highly possible, very exciting indeed. I’m hoping it will build into a successful business as my hand painted kitchen business has done, and I’m confident it will. My grandfather & father would be proud I’m sure.